I love grocery stores that have international food sections. Wegman's is great for this, as is Meijer, two of my favorites. But recently when we were at a Kroger in Houston, I came across a pretty well-stocked international aisle. 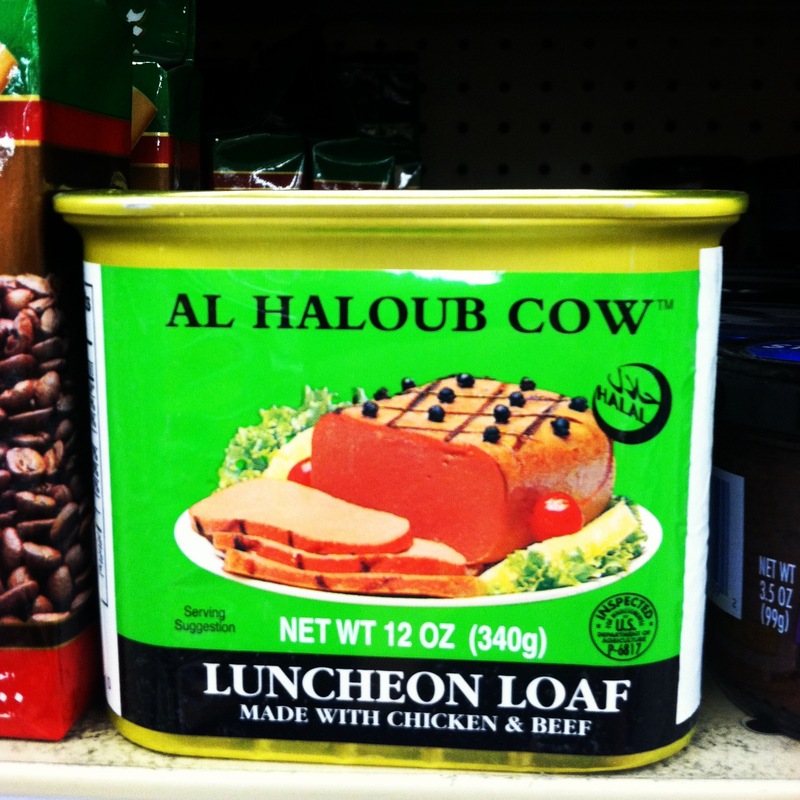 And they had a Middle Eastern section, which is always awesome. Halal is an Arabic word meaning “lawful” or “permissible”. Haram is an Arabic word meaning “prohibited” or “shameful”. These terms not only cover food and drink, but also matters of daily life. When Halal is applied to food, it is used in regard to how the food is prepared and means that Muslims are allowed to eat it under Islamic dietary guidelines. 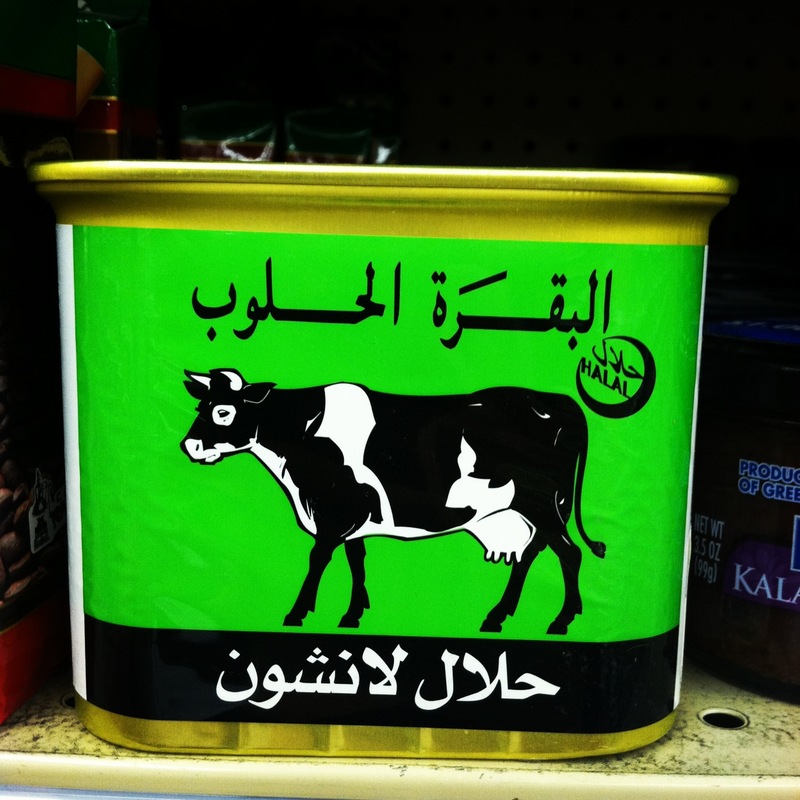 You will notice the can says Halal in the little circle on the upper right. So it's approved for eating. Why they'd want to eat it is another story. Here is the other side of the can, which I like better because it's graphically appealing with the black and white cow against the green background. 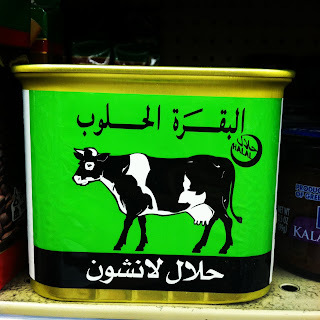 I also love the Arabic lettering. What caught my attention though, and the reason I took the picture, is because as soon as I saw the can I said to Ed, "Muslim SPAM?! No way." Because Muslims don't eat actual SPAM because it's made from ham, this faux SPAM is made from chicken and beef. I'm sure it's still disgusting, because, well...it's chicken and beef in a can. What more can be said? 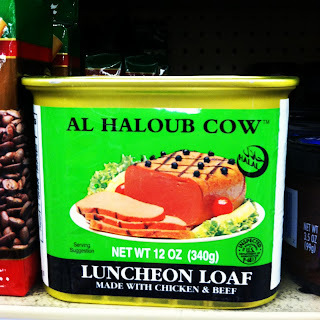 Have never had Spam, but love the packaging of Al Haloub. Love how grocery stores have more and more ethnic foods available. Something to lift up the usual sugar, fat and empty calorie stuff of famous American brands.